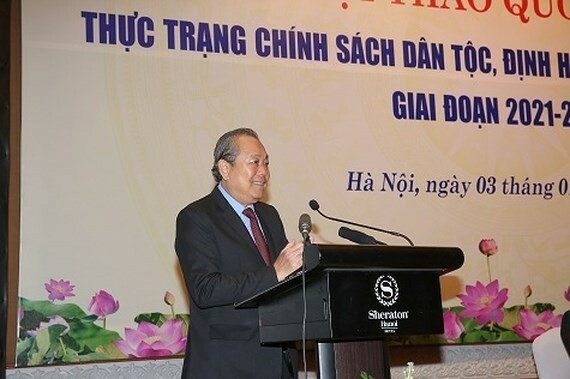 The Party and the Vietnamese Government always take heed to develop mountainous district where most ethnic minority people live because building up unity and solidarity among people is a major task, said Permanent Deputy Prime Minister Truong Hoa Binh at a national symposium on ethnic people policy for the 2021-2030 period yesterday in Hanoi. The symposium was held by the Government’s Committee for Ethnic People Affairs. Thanks to good policies, the mountainous districts have gained achievements comprising of infrastructure for socio-economic development and drop in the poverty rate. Roads were built to connect most communes with the center and households in the districts have electricity. The poverty rate is under 40 percent. 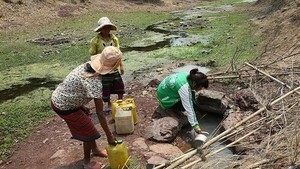 However, ethnic minority people still face difficulties in life. The average income of ethnic minority groups is equivalent to 40-50 percent of the regional average. The rate of households whose economic condition is at poverty line in these disadvantaged districts accounts for 52.7 percent of the total nationwide. The education, healthcare, and culture quality is not as same as other places while inhabitants still find it hard to access to social services. The Government has formulated a socio- economic development plan for extremely disadvantaged districts in 2019 by integrating all policies and measures for sustainable growth in these districts. One of pivotal solution is to enhance levels of education by opening more boarding schools and improve kids’ life skills and integration with the aim to creating favorite condition for them to pursue further study. Vietnam targets that all households in these disadvantaged district have farm lands and fresh water for drinking and daily activities by 2030.